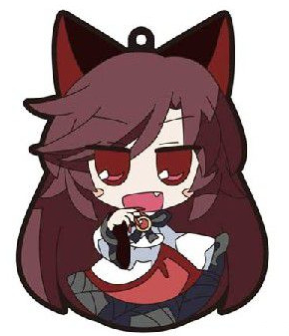 In case you are looking for Touhou Acryl Keychain, kindly click here to see what is available at JList. See more Touhou Rubber Kechains in JList. Touhou is a Doujin shooter games that were developed by one man called ZUN, ZUN alone did all the development, music composition, and the graphics. The early Touhou games were released for the PC-98 NEC computer, but the modern ones are available for Microsoft Windows. While Touhou started as shooter games, where you shoot at targets, all sorts of Touhou merchandises are now available from Music CDs, print media, the games, Manga & even some anime. The music albums are particularly great, which I recommend you to look at if you haven’t before. I hope you enjoy this collection, pick up your favorite Touhou Rubber Keychain now, or just enjoy looking on how kawaii they are. Quality rubber Keychains which are the only way to attach to your keys. Made of 3D shaped rubber that’s pleasant to touch. Each Touhou Rubber Keychain comes in a cellophane package. Made of high quality PVC rubber. Has vivid colors and a great feel to it. Made with loving care for the character’s kawaii SD body. The chain is of premium quality, with an easy to use press-to-release system. As an official Touhou shop licensed by Shanghai Alice and ZUN, J-List has even more of great Touhou related products for you. Patchouli Knowledge is the resident of the Scarlet Devil Mansion, and a friends with the mistress of the house, Remilia Scarlet. She is also the residence librarian. In the games, Patchouli is Stage 4 boss and Extra midboss in Embodiment of Scarlet Devil, along with being Stage 5 target in Shoot the Bullet. She is a playable character in Immaterial and Missing Power & Scarlet Weather Rhapsody. She is also playable in Touhou Hisoutensoku with an expansion. Patchouli is over 100 years old naturally born magician. She posses enormous magic power, though she has a weak constitution. Yuyuko Saigyouji is a ghost “princess”, and the head of Hakugyokurou in the Netherworld. In the games, she is the final Boss of Perfect Cherry Blossom. And is a playable character along with Youmu Konpaku as a duo in Imperishable Night. 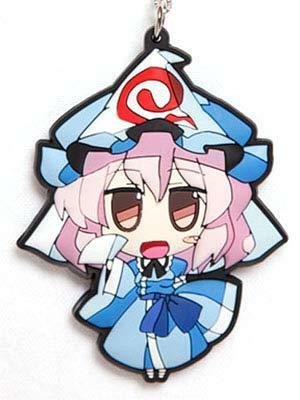 When it comes to abilities, Yuyuko Saigyouji has the ability to end the life of any living being, which makes her extremely powerful. She also has an extremely cunning and perceptive side, and sometimes displays an extraordinary level of knowledge. 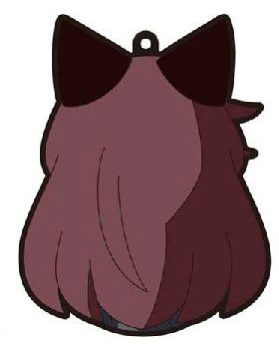 Kagerou Imaizumi is a werewolf, she lives in the Bamboo Forest of the Lost. She has a calm demeanor despite being a werewolf. During full moon, she acquires some characteristics of a wolf. 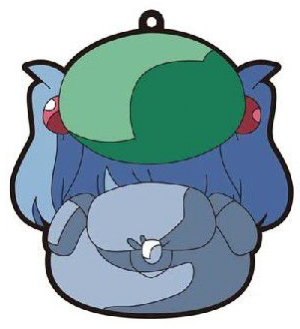 Nitori Kawashiro is a shy Kappa who lives on the Youkai Mountain. She has the ability to control water. Nitori is so timid that whenever she sees a human, she’ll run away from it. Nitori first appeared as stage 3 boss in Mountain of Faith and then became a playable partner with Marisa Kirisame in Subterranean Animism. 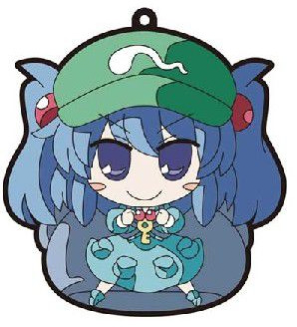 All these Touhou Rubber Keychains I presented here are very good looking, and the Chibi look & the lovely colors on each of them makes them worthy to have for any Touhou owner. 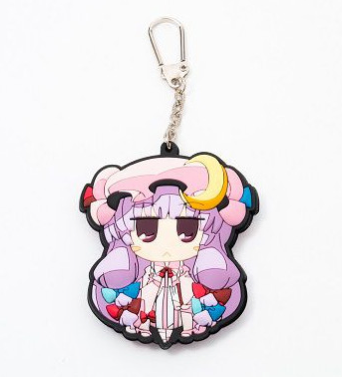 I hope you liked the Touhou Rubber Keychain I presented here, I will post more Keychains here soon. Touhou Project Page on JList.